Your picturesque European river cruise begins on the Rhine River in Basel, Switzerland. You’ll sail to Breisach—with your choice of a visit to Badischer Winzerkeller, or an excursion to the Black Forest. 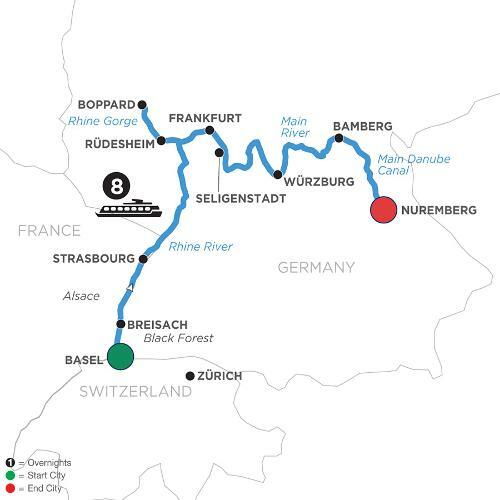 Sail to the city of Strasbourg, France, along the way, and on to the wine village of Rüdesheim through the spectacu-lar views of Rhine Gorge. The modern and charming city of Frankfurt is also on your route along the Rhine River, and you’ll sail on the Main River to visit an authentic Main river village on your way to Würzburg. Take a guided tour of Bamberg, before reaching Nuremberg where your cruise ends. Your grand scenic cruise of Germany brings the beauty and charm of its cities and villages to life. From Switzerland to Bavaria, your German cruise will stay a beautiful memory for years to come!